PHOTO - (left) Brew crew: Running a full brewery and kitchen takes a village; owner Scott Shor (front center) leads the way. (center) Pie time: Wood-fired pizzas are re-imagined with fresh and funky topping combinations, like house-smoked pepperoni, roasted winter squash, arugula, and ricotta, all topped with a drizzle of hot honey. (right) Almost court-side: Sports fans and beer nerds alike will love the large bar with flat screens and taps galore. Imagine you are a bright young creative at a cutting-edge tech company. Your office belongs to a strikingly geometric “campus” with its own popular Saturday morning farmers market. For stress management, there is a light-flooded yoga studio next door. If it’s energy you need, there is organic, heirloom Ethiopian coffee downstairs, as well as a progressive food court full of rotating entrepreneurs and internationally inspired cuisine. And an ambitious craft brewery just moved in, with a kitchen to boot—so at the end of the day, you gather with friends on the patio for happy hour drinks, house-smoked charcuterie, seasonal wood-fired pizzas, and much more. Sound like the perks of a Silicon Valley biz? Think again. In fact, you don’t have to work in Upper King Street’s Pacific Box & Crate complex to access the yoga studio (Reverb), coffee shop (Bad Wolf), food court (Workshop), and brewery (Edmund’s Oast Brewing Co.). At Edmund’s Oast Brewing Co. (or EOBC), don’t expect a carbon copy of flagship restaurant Edmund’s Oast less than a mile down the road. EOBC is decidedly more relaxed, less polished, and more playful than its well-heeled older sibling. It’s less expensive, too, but it takes its food and brews very seriously. A growing number of taps spring from a converted shipping container behind the lofty bar where guests line up to place their drink and food orders before seating themselves. Friendly, attentive servers then bring diners their food and take over from there. Given the excellence of the servers, I’m not sure why EOBC has you queue up at the bar to place your initial order, but I appreciate the first-come first-served intent. 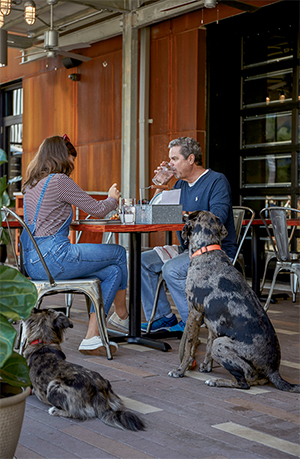 Patio seating offers the perks of watching pups and whatever shenanigans transpire in the courtyard (social gatherings, folks on bikes, kids bouncing balls) while you snack on wings or boiled peanuts cooked with beer and ham. Inside, it’s equally engaging, if at times a little loud. The towering 20,000-square-foot warehouse has plenty to hold your attention: flat screens for sports fans, a window onto the massive brewery floor, and funky floor-to-ceiling graphic paintings. The same artwork, a clever cross between medieval imagery and The Grateful Dead, adorns the wood-fired oven where pizzas are cooked with creative, seasonal toppings on naturally leavened sourdough. Pie options are anything but predictable, like spicy shrimp with a drizzle of nam prik (a classic Thai dipping sauce); winter squash and hot honey; smoked brisket with a mozzarella blend; and fried potato skins with house-cured bacon—think of it as pizza’s take on a loaded potato. PHOTO - Rich rewards: What pairs best with an ice-cold pint? A round of hearty, flavor-packed dishes, like a thick stew starter made with pickled peanuts, bits of pork, and rice (above left) and a decadent pudding featuring artisan bread from Root Baking Co. (above right). An authentic Polish smokehouse out back cranks steadily to imbue house-made hot dogs with fireside flavor and to smoke things like bacon, mayonnaise (that’s right—smoked Duke’s! ), and heritage pork. The pulled pork pairs up with house-cured ham on a pressed Cuban sandwich, elevated with a spicy citrus dipping sauce. The most successful items on the menu, in my opinion, are the messiest. EOBC’s meatloaf sandwich borders on the outrageous, stacked with an onion ring “gravy moat” designed to drip down your fingers when your bite breaks the onion ring-encircled gravy dam. Similarly, the blackened catfish sandwich slathered with Cajun mayo is a moist, delicious mess. As for beverages, flagship Edmund’s Oast is known for excellence in brewing, and EOBC takes that ball and runs with it. I gambled on a pint brewed with Upstate heirloom watermelon juice (watermelon plus beer?) and was frankly surprised by its depth of flavor and subtlety of fruit. Whatever your taste—stouts, ales, citrusy IPAs, hop-less beers—when you find a favorite, there are shelves of dragon-tailed growlers ready to bring home. Sometimes when savoring great beer, though, all you want is a really good burger. EOBC taunts us by offering up a fabulous dry-aged steak burger solely as a special. I would love to see that added as a regular home run to an already enticing lineup, coupled with the killer chunky potato fries cooked papas bravas-style. PHOTO - Bellies full, be sure to sit back and watch the pups on the patio. Other than the lack of a consistent burger on the menu, if EOBC falters, it could be that the kitchen works too hard to create the unexpected. Not all dishes will please everyone. I failed to appreciate a brunch dish of braised cracklings and a poached egg—something that sounded appealing in theory but yielded a limp and gelatinous texture. (I don’t know about you, but I need cracklins to crackle.) A roasted cauliflower dish came so overly sauced with Romesco that I couldn’t even recognize the fire-roasted vegetable I craved. Dessert, however, saved the day by showcasing Root Baking Co.’s thick-crusted, high-quality bread in a pudding mellowed by caramel sauce. Go for the generous platters on Fish Fry Fridays, for mid-week live music, and for ample charcuterie spreads to underpin all that good beer. Go for messy sandwiches and surprising pizzas, for dogs and friends. Go for the novelty of visionary design in an unexpected locale and for a brewery that’s young and passionate about its bites as much as its beer.